With summer officially starting next week and temperatures already in the triple digits, there are heat restrictions in place and things to remember to stay safe and healthy. File Goldstrike Canyon and Arizona Hot Spring trails within Lake Mead National Recreation Area are closed to prevent hikers from endangering themselves. 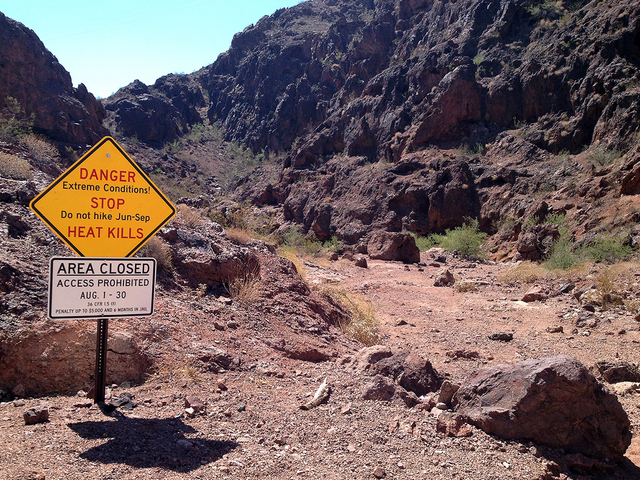 Because of the heat and risk to hikers, Goldstrike Canyon and Arizona Hot Spring trails in the Lake Mead National Recreation Area are closed through Sept. 30. Even though the hot springs are still accessible by the river, the trailheads and trails are closed, said Christie Vanover, public affairs officer at Lake Mead National Recreation Area. The Park Service has been routinely closing the canyons for the past several years because of the danger posed to hikers and rescue crews. This season, there have been five heat-related incidents and no deaths at Lake Mead, Vanover said. There are also fire restrictions in place. Currently, the use of campfires, charcoal stoves and fireworks are prohibited at all parks within the Bureau of Land Management, Bureau of Reclamation, National Park Service, U.S. Fish and Wildlife Service, U.S. Fire Service and Mount Charleston Fire Prevention District, although the use of portable gas stoves, jellied petroleum or pressurized liquid fuel is allowed. There are some exceptions for fire use in certain areas. At Lake Mead, wood or charcoal grills are allowed on the shoreline where natural vegetation is at least 100 feet away, and barbecue grills are allowed on private boats outside of the Lake Mead and Lake Mohave harbors. For U.S. Forest Service parks and campgrounds, campfires are allowed within approved fire pits or grills. For those who are planning recreational activities on a lake, Lake Mead National Recreation Area Public Affairs Specialist Chelsea Kennedy said that it’s important to boat safely by following navigation rules, maintaining a proper lookout and safe speed, and by watching the weather and having the correct safety equipment on board. She encourages people to follow the LAKE acronym. L: Life jackets save lives. Wear them. A: Alcohol, if you drink it, don’t drive. K: Know the weather. Know your limits. E: Eyes on your kids. Eyes on the water. Eyes on fellow boaters. Another major element of summer safety is protection against the sun. The Southern Nevada Health District encourages people to take precautions. When planning extended outdoor activity, bring an adequate supply of water, and drink plenty of water at regular intervals, regardless of the activity level. Plan activities earlier in the morning or later in the evening. Dress in light, loose-fitting clothes. Wear a wide-brimmed hat to protect the face, and use sunscreen. Avoid being out in the sun for extended periods. It’s also important to be mindful of pets during the summer heat. Las Vegas nonprofit the Animal Foundation has some tips for how to care best for them. Bring your pets indoors when it gets into the triple digits. At those temperatures, shade cannot effectively cool a hot pet. Walk pets during cooler hours when the sun is not as harsh. It’s also a good idea to walk them on dirt or grass rather than on sidewalks and pavement to protect their paws. Travel cautiously with pets, as pets can overheat in cars in as little as 10 minutes even with the air conditioning running. Dogs and cats need water, too, so it’s a good idea to provide them with plenty of it. Watch for signs of heat stroke, which include heavy panting, glazed eyes, rapid heartbeat, difficulty breathing, excessive thirst, excessive drooling, fever, vomiting, seizures or unconsciousness. In addition to hiking, camping and boating another popular summer activity is swimming, and with it the Southern Nevada Health District encourages people to patrol, protect and prepare. Patrol: Designate an adult to watch when children are in pools, lakes and even bathtubs. Protect: Install barriers between the house and pool. Prepare: Create a safety plan that includes having a nearby phone, knowing CPR, having rescue tools and enrolling kids in swim classes.